In case of goyim it is only if they aren't chasidey umoys. Not at all. Taniya doesn't give all details on the subject. There is a significant difference between an idolatrous evil goy, and ben Noyach who is a chosid umous. Tania just isn't speaking about it. Tania quotes there "Shaarey Kdusho" of Rabbi Chaim Vital. Also, condition isn't static (i.e. that the soul of the goy is coming from klipoys tmeyoys). Therefore if the goy becomes chosid umoys - he elevates his soul. This is obviously false, because any goy can become a chosid umoys through tshuvo. Even more - he can become a ger, elevating his soul even higher. Where did you find that his soul is "sealed"? The counter proof to your statement can be found in "Toymer Dvoyro" of the Rama"k ztz"l, in the chapter speaking about midas haGvuro, where he says, that even though the source of the Kain's soul was bad, he could do tshuvo nevertheless, fixing himself. I understand how you feel. But the words of the Tanya are merely quoting the ARI zal. However one understands it, this distinction is inescapable (consider the text of havdalah, for example). A broader context in which this should be understood is taharos -- the category of halakhah dealing with tumah (ritual impurity) in the days of the Beis HaMikdosh. A parallel from outside of Judaism would be the Hindu caste system and the strictures applying to the Brahmins, which still are followed by most Hindus today. These inyanim clash with our western liberal sensibility, which I share -- but they are rooted in ancient tradition and can't be so easily dismissed by a religious Jew. ASJ asked me if this was offensive to me as a non-Jew (a Bat Noach)Here is what I said to him. I think that the subject being discussed is beyond me in terms of my Torah education. It seems kooky to me, more than offensive. But maybe that's because I don't know what I'm talking about. Gentiles have to deal with the fact that there is some stuff in Torah that is really harsh towards non-Jews in the sense that some Jews strongly attribute certain characteristics to certain nations. And let's just face the cold, hard truth about this (because it's a mitzvah): Gentiles have been awful towards Jews since forever, so we haven't done much to disabuse anyone of these notions. I am dedicating my life to making this better, because it is true that we have behaved like devils. As loopy as it may seem, I want to undo all of the pain from the Holocaust and make sure it never happens again. What that really means is that I want to bring Moschiach. That's not nutty at all. What better thing could we do with our lives? That's what Jews are trying to do too. And there is a framework within Torah for us to help each other with this. On the positive side, the Gemora in Brochos tells how Rav Gidal would sit near the mikveh entrance so that the women would see him as the walked out -- and this act of gazing upon a tzaddik would greatly benefit their future children. Now if I were a cat or a mikveh lady I'd be really offended. Bill - the mitzvot of ritual purity are one of the areas of the Torah that are "chok", beyond an explanation. As we do not have a functional Beis HaMikdash (Holy Temple), we aren't practically concerned with them today in most cases. Women's mikvah is an exception. Similarly with souls, levels of souls, and missions of souls. Either there's something unique in the Jew's acceptance of Torah and obligation of mitzvot, or there's not. Rabbi Jacobs - your comment #2 surprised me. My wife is an experienced mikvah lady, with senior teachers, who follows strict halacha and adds many chumros. She's always been particular about touching the ladies when they come out, and giving brachos. Yet, I've never heard of mikvah ladies making any point of avoiding their job when they are personally niddah, or any such chumrah in this area. Do you have a source for adding the point "even if they're niddah"? 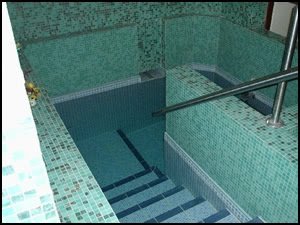 Is there a problem if the Mikvah lady is Nidah? Akiva: If you reread the quote from my book, you'll see that meeting another woman in the mikveh, even if that woman is niddah, does NOT adversely affect her immersing. (I think you simply read that line quickly, and thought that such a woman is one of the things listed earlier. The source is Bodei Hashulchan 198:377. Here is the quote, again, (to save from scrolling): "In my sefer, Family Purity (pg. 125), this is our language: "When leaving the water, the 'Mikveh-lady' approaches and touches her. If she saw something impure first, for example a dog, cat, donkey, pig, or non-Jew, before seeing the 'Mikveh-lady' (or one of the other women in the mikveh even if she was niddah) ideally she should immerse again, if possible." Bill (above). The Tanya does not create new concepts. It does not present unique ideas. It accents thoughts and themes already found in traditional Torah literature. An intellectual glance at any footnoted Tanya will show that. The specific concept noted above, specifically from which spiritual banks souls are drawn is based in Zoharistic literature. It's also mentioned in the Oral Torah. Those points aside. The attitude that a soul comes from kedusha holds tremendous ramification. More than privilege, that translates into obligation. The Tanya's concept of kedusha is closely related to: Above self. Something higher than one's own nature. The view that a Jew's psyche stems from the bank of kedusha does not translate into a releasing from responsibilities. To a puffiness, a grandeur. It translates into a demand towards selflessness from ego. Selflessness from oneself. To rise up to kedusha through Torah and mitzvahs. That is what the Tanya says this psyche wants. I don't see many people in the world fighting for that right. Regarding those that do, I don't think anyone will stop them. Correction: The exact place where the Rama"k speaks about Kain's soul is in chapter 4 (speaking about "Bina"). become better and rooted in the holy just as Cain was told he could be good. it into the good so that it becomes rooted above in the holy. days will be spent in repentance. This morning I came across an idea in the Biala Rebbe's Maamar Techias Hameisim that provides additional insight into my original question. The Biala Rebbe taught, "There is a tradition from the Baal Shem Tov and his disciples, that every mitzvah and every discussion of our Sages is relevant to every person at all times."